Porsche have released details of their road racer version of the 997. The legendary term â€˜RSâ€™ will set the pulses racing of 911 fans and track day enthusiasts alike, and this model seems set to be a worthy successor to that title. 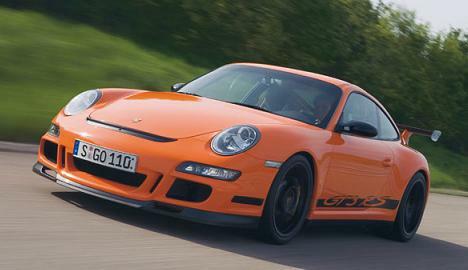 The body is 44mm wider than its GT3 cousin, thanks to the use of a Carrera 4 shell. The RS is also 20kg lighter than the GT3 model, with the help of a carbon fibre rear wing, plastic boot lid and rear window. Further weight is shaved from the car by the way of lightweight carbon composite bucket seats. Once you’re sat inside the car thereâ€™s a full roll cage, six point harnesses and a fire extinguisher, just to remind you of its sporting credentials. Power is provided by a naturally aspirated 3.6 litre engine providing an astonishing 415 bhp. A close ratio six speed transmission, coupled to a single mass flywheel enables the RS to sprint to 100 kph (62mph) in 4.2 seconds. 200 kph (124 mph) is achieved in only 13.3 seconds, on its way to a 310 kph (187 mph) top speed.